It's easy to want to be a good partner. After all, doesn't everyone want to be seen, heard, understood, and loved for who they really are? Those things seem fundamental to any good relationship, but particularly to a romantic partnership. However, in order to find these things, it turns out that we need to be able to offer those things to others. No one is going to want to expend the effort to understand a person who doesn't try to understand them and, at least over the long term, no one is going to try to love a person who doesn't make an effort to love them. In order to have a good relationship with a partner, then, we need to learn to be better partners ourselves. Marriage and happiness go together. While scientists aren't exactly sure how they work together, the science shows us over and over again that people in strong and long-term romantic relationships are happier than those who are not. Add that to the fact that close and supportive relationships in general, whether romantic or not, improve our overall wellbeing, and that's strong motivation for making our partnerships as good as they can possibly be. 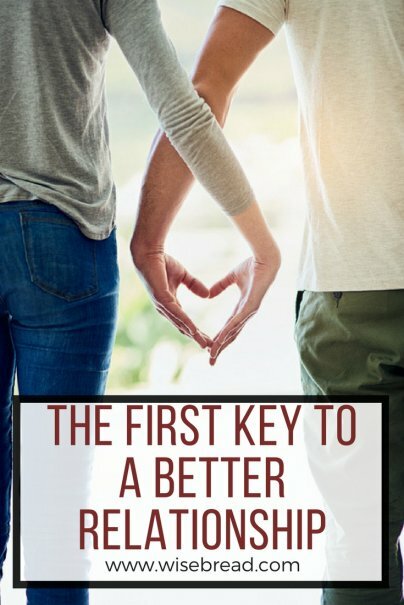 Being a good partner can involve a lot of hard work, especially when it means changing behaviors that are deeply ingrained, or choosing to change in the context of a relationship that is already difficult. If making those changes can lead to long-term happiness, though, it seems like they should be worth the effort. And you may not have to change as much as you think. Instead of starting with external actions, start by thinking differently. Knowing yourself is the basis for all of life, let alone for any relationship, romantic or otherwise. Most of us think we know ourselves pretty well, but the truth is that there is always more to know. Knowing yourself is also the basis for good conflict resolution, which is essential for every relationship. After all, any time there is more than one person involved in a situation, it's only a matter of time until there is disagreement. Taking the time to work through the questions listed at the link at the beginning of this section can help you think about aspects of yourself that you may never have pondered otherwise. Most people find that questions like these are just a jumping-off point for deeper and more intense self-knowledge. I don't know a single person who, in the course of getting to know themselves, has not encountered something that they didn't really like. We are all human, we all make mistakes, and we all have negative characteristics and habits that we aren't proud of. We can beat ourselves up over these things, or we can accept them. While accepting them is the harder road, it is also the one that makes us better partners, because it leads us to being secure in who we are. When we are secure, we aren't looking for a partner to give us that, and we are free to simply be ourselves with someone else who is secure in themselves. This takes a lot of pressure off the relationship and allows it to simply be what it is. Many of us don't know our partners as well as we think we do. People change, or we simply don't bother to really get to know them in the first place. John Gottman, one of the leading researchers into what makes relationships work, calls knowing your partner "building a love map." When you know someone well, you know how to love them. You know what things mean to them, what is happening when you say one thing but they seem to be hearing another, and which things seem like they would indicate love but, for whatever reason, don't do that for your partner. Have fun and learn more about your partner by playing Gottman's 20 Questions Game. Even if you don't do very well, you will learn about your partner and can do so in a fun, low intensity way. Once you know your partner, you have to accept them. It's much easier to get to know someone, choose several things you'd like to change about them, and set about that task. However, you can't change someone who doesn't want to change. Trying to do this will exhaust and frustrate not only you, but your partner as well. Accepting someone starts when you realize that your partner, too, is human. They aren't perfect, because no one is. And this will be true no matter who you are with. There will always be something about your partner that you wish was different. If you have already worked to accept yourself, this will be an easier task. When you know where your own humanity is frail, it is easier to accept the frailties of others. Listening to your partner, accepting them, and then sharing yourself with the trust that they will also accept you, is the path to intimacy. You have work on both the giving and receiving sides, though. If you just work one side, the relationship will be lopsided, and neither you nor your partner will be happy. Learning how to listen and how to share can be an awkward path. Every relationship is different, and so there will be times when it is appropriate for you to listen and other times when you will need to share. It can help to be open with your partner about this awkwardness. You can begin by simply asking them if it is a good time when you want to talk, or inviting them to share when you realize you haven't listened in a while. Being a good partner isn't something that you can achieve overnight. It takes work, intention, and opportunity to learn how to love another person well. When you put your relationship first and give yourself time, many of these things will fall into place as the days, weeks, months, and years pass. How do you strengthen your relationships? Please share in comments!